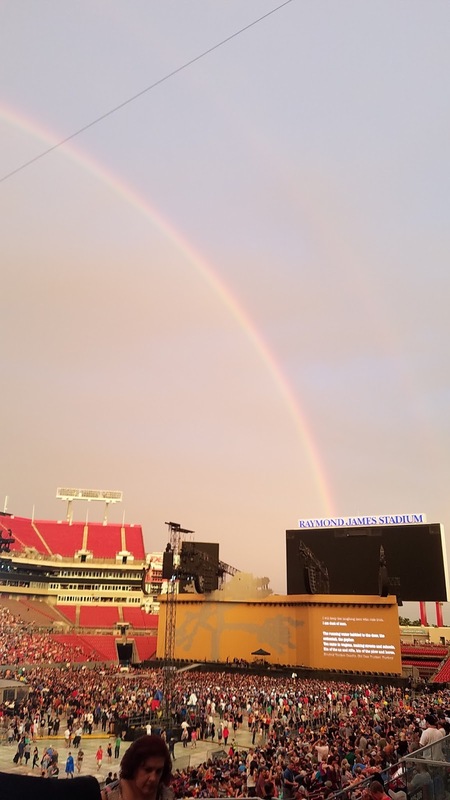 The show opened with a double rainbow and ended with a religious experience! I'm not a regular concert-goer, but U2 is one of my fave bands, and it was incredible seeing them live! "SP-CMC-8 - SONY PCM-M10 "
Location: General admission floor at front of mixing desk. Traffic from Orlando to Tampa on I-4 was awful on the way to the concert. A 1.5 hour trip took about 3 hours. Not good. It also was raining for most, if not all, of the way over. I also heard a terrible story about another taper who got busted and his gear confiscated at the Miami show a couple of days earlier. All of this wasn’t making for good karma in the moments before the show started. But, an enormous rainbow appeared as the rain stopped just before show time. I got my gear in no problem, and all was well. Another amazing show by U2, perhaps better than in Miami where Bono seemed a bit taken aback by the heat and humidity. This is a different recording than Kevdogg’s. His was from section 207. I was in the general admission floor area at the front of the mixing desk area. Let me know what you think of the quality. And as always, trade freely and never sell. "No One Gets Hunted (Tampa '17)"
^Location: General admission floor at front of mixing desk. the speaker stacks and also picking up the crowd atmosphere nicely. sometimes it seemed to have worked pretty well. Nothing too disturbing though. and presence, causing a little instability in clarity (e.g. Pride, In God’s Country). But perhaps I’m making it sound more serious than it actually is. Overall this is just an excellent audience recording of a very strong JT2017 show! adjustments here and there for a smooth listen. I asked hannahb (on u2torrents) for permission to share and all was OK.
"Traffic from Orlando to Tampa on I-4 was awful on the way to the concert. taken aback by the heat and humidity. This is a different recording than Kevdogg’s. His was from section 207. I was in the general admission floor area at the front of the mixing desk area. Let me know what you think of the quality. And as always, trade freely and never sell." > SanDisk 8gb CF card > PC > Audition 1.5 > TLH > FLAC 8.
the auction sites and flag those sellers regularly. your captures! Im glad I could finally give back. "the model of mics used were MM-BSM7."